This is a made to order item. Please allow up to 2 weeks production prior to shipment. Once shipped, please allow up to 2 additional weeks transit time for your item to arrive. 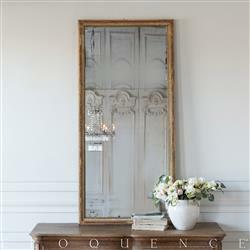 Simple two part original mercury glass mirror in classic Louis XVI style. A simple string of beads decorate the inner frame keeping this beauty simple and effective. This ancient mirror is in excellent condition considering its age, with only minor scratches and distressing to the glass. Will add old world charm and delight in a hallway or a bedroom.